Click on the photo and see all the photos of Comfort Inn Amherst. WiFi available in all areas, Non-smoking rooms. The Comfort Inn Amherst offers guests a daily hot breakfast. The hotel offers free parking and cold weather vehicle hookup. The guest rooms at the Amhert Comfort Inn feature cable TV. The rooms also have a work desk and coffee maker. 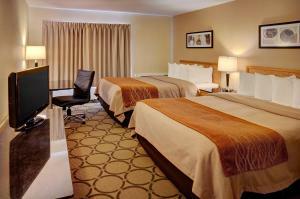 Renovated in December 2013, The Comfort Inn Amherst is within a 5-minute walk to Sunrise Trail. Joggins Fossil Cliffs is within a 50-minute drive from the hotel.